The CAP reform needs to tackle two key challenges simultaneously: ‘greening’ the agriculture sector (reducing agriculture's environmental impacts) and ensuring food security. To meet a growing global demand for food and fodder, one can opt for increasing yields through intensification and/or for extending the land base used for agricultural cultivation. Intensification and concentrating food production in the most productive regions may appear the most efficient way to use the land. However, risks to food security may be increased, because supply chains become more vulnerable and because of pollution. Loss of crop diversity, decline of pollinators and increased vulnerability of monocultures to diseases are additional stress factors. On the other hand, regional or local self-sufficiency and the reliance on extensive farming systems would require more cultivated land at the expense of natural habitats. It is not enough to only increase total food production. The food must also be locally available, affordable and meet quality standards. The distribution channels and trade patterns are key in this respect. As long as we can afford to import food from other parts of the world, European food security may not seem to be at immediate risk, regardless of our support to European agriculture. But the choices we make will affect trade and global food security, as well as availability of local food products, with implications for chain control, food safety and other quality concerns. Currently, the EU is by and large self-sufficient for cereals, butter and beef, but a big net-importer of fodder for domestic livestock production. Food security can also be tackled from the consumption perspective, for example by looking at the efficiency gains from changing diets. Livestock production is more than six times as inefficient as crop production in terms of protein output, and hence meat diets are associated with higher land take and nutrient losses (PBL 2011. The protein puzzle. The consumption and production of meat, dairy and fish in the European union). Efficiency gains can also be achieved through waste reduction in households and in the distribution chain. Based on data from Eurostat and national data, it has been estimated that around 89 million tonnes or 181 kg per person of food waste was generated in the EU‑27 in 2006, of which 42–43 % was from households, 39 % from manufacturing and the rest from other sources including retailers, wholesale and the food service sector (but excluding agricultural waste). A recent study showed that in the United Kingdom an estimated 137 kg/person or 25 % of food purchased by households ends up as waste. Agriculture is one of the main sectors affecting the environment through its direct impacts on land cover and ecosystems, and on global and regional cycles of carbon, nutrients and water. At the global level, agriculture contributes to climate change through emission of greenhouse gases and reduction of carbon storage in vegetation and soil. Locally, agriculture reduces biodiversity and affects natural habitats through land conversion, eutrophication, pesticide inputs, irrigation and drainage. Unsustainable agricultural practices may also lead to direct environmental feed-backs such as soil erosion and loss of pollinators (because of excessive pesticide application). Nutrient loading (mainly by phosphorus and nitrogen) is a major and increasing cause of biodiversity loss and ecosystem dysfunction. Most detailed information is available for nitrogen. Estimates show that the total amount of reactive nitrogen in the environment has doubled globally since the pre-industrial era, and more than tripled in Europe. This is primarily due to fossil fuel combustion and the application of industrially produced nitrogenous fertilisers. Excess reactive nitrogen causes air pollution and eutrophication of terrestrial, aquatic and coastal ecosystems. Agriculture contributes 50–80 % of the total nitrogen load transported into Europe’s freshwater ecosystems and, ultimately, coastal waters and seas (Figure 2). Figure 2. Diffuse emissions of nitrogen to freshwater from agriculture, Source: EEA 2010. The European environment – state and outlook 2010: freshwater quality, European Environment Agency. 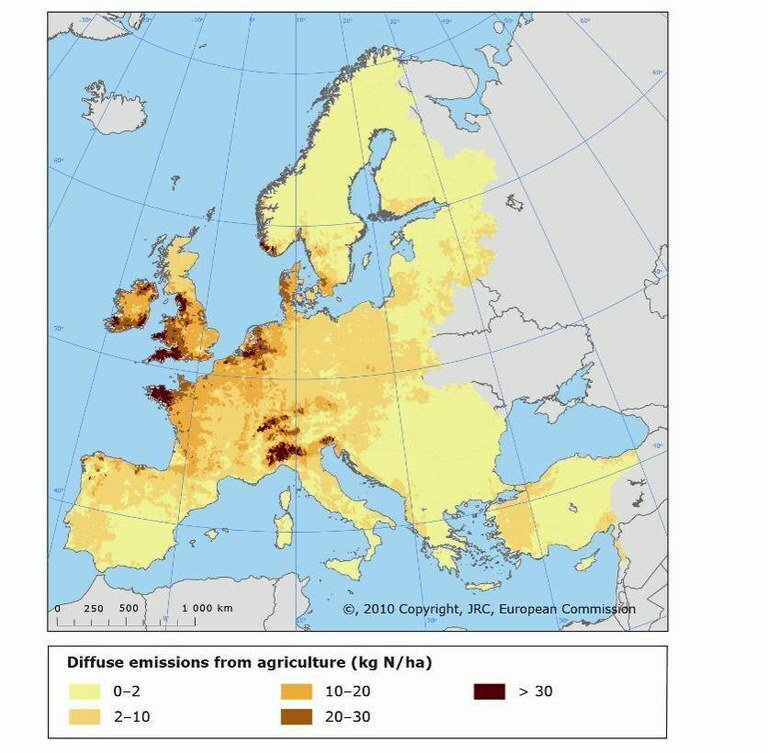 Despite substantial reductions in nitrogen pollution from key polluting sectors and sources over the last two decades, critical nitrogen loads are still being exceeded throughout much of Europe. It is estimated that in 2010 more than 40 % of sensitive terrestrial and freshwater ecosystem areas were subject to atmospheric nitrogen deposition above the critical loads (Figure 3). Figure 3. 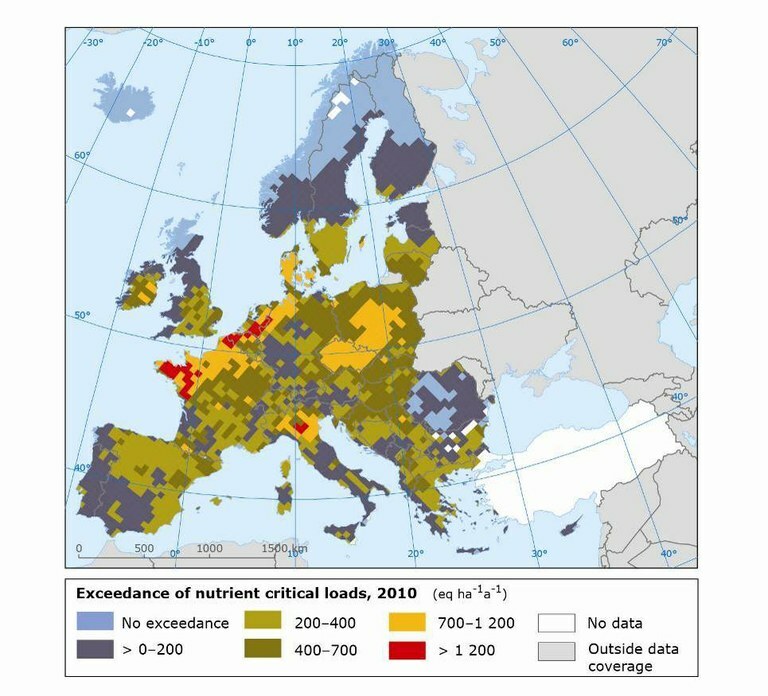 Exceedance of the critical nitrogen loads for eutrophication in Europe (as average accumulated exceedances). Note: figures for 2010 are model based and were computed using the 2008 Critical Loads Database hosted by the Coordination Centre for Effects (CCE). Source: CSI-005 indicator, based on Hettelingh et al. (2008). A critical load is defined as 'a quantitative estimate of an exposure to one or more pollutants below which significant harmful effects on specified sensitive elements of the environment do not occur according to present knowledge' (UNECE, 2004). The environmental pressures from agriculture are reflected in loss of natural capital. The conservation status of agricultural habitats protected under the Habitats Directive is worrying and considerably worse than average. Only 7 % of the assessments showed a favourable conservation status compared to 17 % for all habitat types. Half of the agricultural habitats are considered to be in a bad status. Lake and river ecosystems fare slightly better, but their conservations status is also worse than average. As for the marine environment, all habitats in the North Sea and the Baltic Sea are considered to be in a bad or inadequate state. On the other hand, agriculture may also contribute to the maintenance of species-rich semi-natural habitats. Conservation of this ‘high nature value farmland’, primarily restricted to peripheral regions in northern and south-eastern Europe, is an explicit goal of EU biodiversity and agriculture policy. Many of the species listed under the Bird and Habitat Directives occur on farmland (some almost exclusively) and many of the targeted habitats are semi-natural and depend on continued (extensive) agricultural management. Conserving these extensive farming systems is increasingly difficult because of socio-economic constraints (lifestyle changes, demographic trends, economic marginalisation). Figure 4. 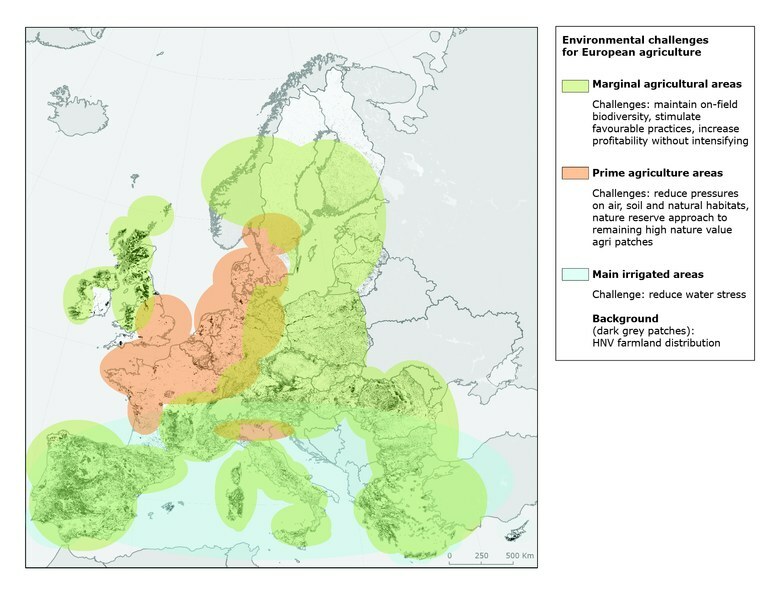 Environmental challenges for European agriculture. For references, please go to https://www.eea.europa.eu/themes/agriculture/greening-agricultural-policy/food-security-and-environmental-impacts or scan the QR code.